The Black Rock Community Council and the Connecticut Society, United States Daughters of 1812 announce the official unveiling of Commodore Isaac Chauncey plaque at his boyhood home at 150 Seabright Ave. The dedication ceremony will take place on Saturday, Oct. 13, at 11 a.m.. The master of ceremonies for this event will be Richard Iannucci, Commander of the Port 5 Naval Veterans from Bridgeport and the keynote speaker will be Betty Oderwald, president of the Connecticut Society, United States Daughters of 1812. Other participants in the ceremony include the Fairfield Gaelic Pipe Band and the Firing Squad from VFW Post 9460, Stratford. An official mayoral proclamation will also be presented, declaring Saturday, October 13, 2012 as “Isaac Chauncey Day” in Bridgeport. A reception will immediately follow at the Port 5 Naval Veterans clubhouse. Born in 1772 in Black Rock, Chauncey went on to become the Great Lakes naval commander during the War of 1812. Chauncey also fought in both wars against the Barbary Pirates and served as president of the Board of U.S. Naval Commissioners from 1837 until his death in 1840. The formal recognition of Chauncey’s career is taking place on the 237th anniversary of the founding of the U.S. Navy and the bicentennial year of the War of 1812. 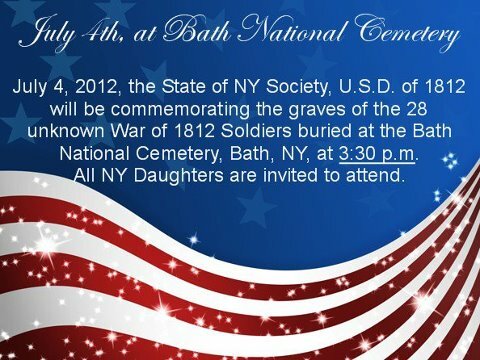 War of 1812 Soldiers buried at the Cypress Hills Cemetery, in Brooklyn, NY. State of NY Society President, Jan Johnpier, Niagara Frontier Chapter, U.S.D. of 1812, Junior Member, Brooke Johnpier, NY State Chaplain, Phila Ibaugh, NY State Chairman of the Veterans Rehibilitation Committee, Shirely Canfield, Niagara Frontier Chapter President and Honorary NY State President, Jeanette Brooks, and special guest, Barbara Diebold, who is the Regent for the Niagara Falls Chapter, of the DAR. CLICK HERE BROCHURE NORTH CAROLIA 1812; TWO CONFERENCES TO COMMEMORATE THE BICENTENNIAL OF THE WAR OF 1812-North Carolina Maritime Museum, Beaufort, North Carolina, Friday, June 29, 2012 and Fort Johnston, Southport, North Carolina, Saturday, October 20, 2012 sponsored by the North Carolina Humanities Council and the North Carolina Society Daughters of 1812. Event Description: State and Local scholars will present information aboutNorth Carolina’s lowerCapeFear region in the War of 1812. The content is relevant to academics, historians, archaeologists, re-enactors, genealogists and the general public. The five seminars are:FortJohnston in the War of 181 Jim McKee; North Carolina Gunboats,Jim Greathouse; Home Front/Uniforms & Clothing; Captain Johnston Blakely, Andrew Duppstadt; N.C. Soldiers in the War of 1812, Jeff Bockert. All seminars will take place at theSouthportCommunity Center. 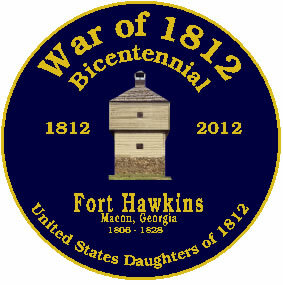 In addition, living history demonstrations will take place throughout the day on the grounds of historicFortJohnston. 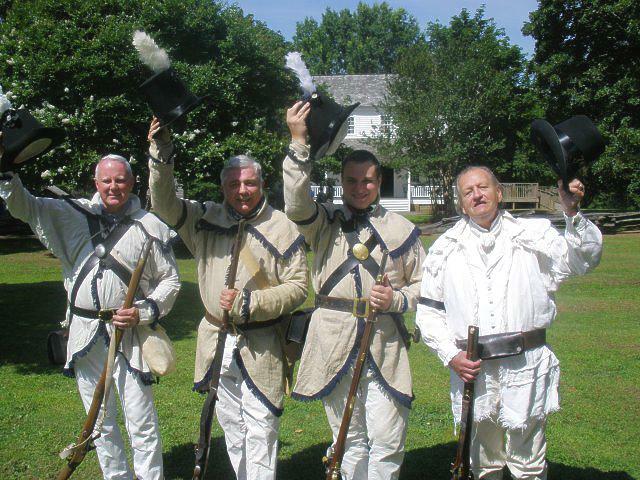 Historical interpreters will represent American soldiers and sailors, British soldiers, civilians and perform musket demonstrations, camp life, children’s games, camp crafts and more! With The Woodlands Fire Department’s Engine 101 flashing its lights and sounding its horn, dozens of proud Woodlands citizens raised red, white and blue bells in the middle of Market Street Square, echoing a nationwide sentiment in recognizing the bicentennial of the War of 1812. On June 18, 1812, President James Madison signed the declaration of war, and on Monday, The Thomas Bay Chapter of the U.S. Daughters of 1812 was one of many groups across the country ringing at bells at noon to commemorate the moment. Many of the chapter’s 109 members are descendants of soldiers who fought in the war, President Janisue Rigel said. Thomas Bay, a corporal in the Tennessee militia, and Thomas Peter Cartwright, a captain in the 6th regiment of the Mississippi militia, both settled and were buried in Montgomery County, while Rigel is a descendant of two other patriots, Jacob Riegel and John Whitemore. Texas has 22 chapters of the Daughters of the War of 1812 and more than 750 members, the most of any state in the nation, and many of them were holding similar events Monday. The bells ring five times, Rigel said: For the sailors of the war, the soldiers of the war, the Star Spangled Banner, for veterans and current military and for the United States of America. “Lest we not forget, we remain the land of the free thanks to the brave,” she said. Although they could not attend the event, Gov. Rick Perry, Rep. Kevin Brady, R-The Woodlands, and State Sen. Tommy Williams, R-The Woodlands, were among several who wrote proclamations recognizing the day’s importance. Williams’ proclamation, which was read aloud, recognized Andrew Jackson’s victory in the Battle of New Orleans and the creation of the “Star-Spangled Banner,” written by Francis Scott Key as he watched the British fail in their attack on Fort McHenry. “It helped forge our strength, because after that we knew we could do anything,” said Liepman, a Woodlands resident since 1974. 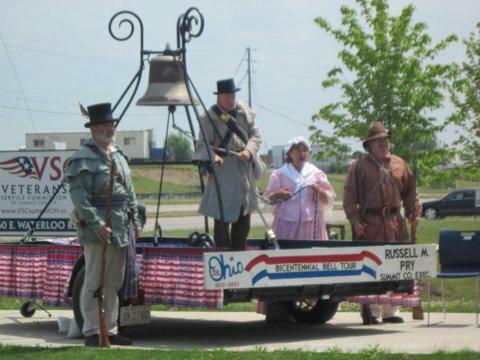 The event attracted a number of onlookers intrigued by the flags and the 1800s garb and uniforms, but it also attracted those interested in showing their patriotism. Local surgeon Robert Neville and his son Garrett attended the event. Garrett Neville received a scholarship from the organization and Robert Neville has several patients who are members of the group. For him, showing his patriotism was most important. “It’s important to honor our country as well as not forget about our history,” Neville said. An incoming freshman at the University of Texas, Grant Neville believes it is important for young people to appreciate historical events such as the War of 1812. Today, Saturday, June 23 10:30am at Evergreen-Washelli Cemetery, Seattle, WA.